"Here they fenced off all that they wanted. If it was a pretty valley, for that reason they appropriated it, if it was beautiful pampas, they closed it out. They left us among the stones, among the worst fields" says a Mapuche farmer Rogelio Fermín. New Colonization of Patagonia "Patagonia gives me an amazing sense of freedom," said Carlo Benetton when assuming ownership of the Argentinean territory. In 1997 Benetton bought out the British-owned Compania Tierras del Sur Argentina S.A. (CORP) for a total of $50 million. The records of CORP acknowledge the presence of indigenous people in the area. In return for the land that has been occupied by Mapuches for 13,000 years, Benetton constructed the Leleque museum, located in front of the Benetton estate in Chubut, to "narrate the history and culture of a mythical land." Two hundred meters away from the Leleque Museum live a Mapuche family called the Curiñancos. Atilio Curiñanco was born and raised in Leleque, but later moved to neighboring Esquel. After suffering from Argentina's economic crisis in December 2001, Atilio and his wife Rosa decided to return to the fields, and attempt to grow their own food, raise animals, and establish a micro-enterprise. "It all started when we proposed to start a family enterprise in Santa Rosa," says Atilio Curiñanco, age 52. "I have known that land since I was born, and I saw that nobody occupied it, so we thought it would be a good opportunity." The Curiñancos contacted the Instituto Autárquico de Colonizacion (IAC), a government-managed real estate agency, to request permission to occupy an estate called Santa Rosa, situated in front of one of Benetton's properties. 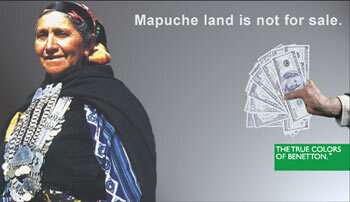 The land is well known to the Mapuches as unoccupied indigenous territory and was verbally confirmed as such by IAC. After waiting 8 months, the Curiñancos hadn't received a response about the Santa Rosa property. Finally IAC presented a note to the family saying "information has been obtained that leads us to believe that the property is zoned commercial" and that "our interest is to reserve it for a micro-enterprise." The Curiñancos showed up at the Esquel Police station in Chubut to make it known that they would occupy Santa Rosa. In the same afternoon, a group of campesinos began to work the land with the little resources they had -- plowing, sowing vegetables, and bringing in farm animals. "We went to land without harming anyone," says Atilio Curiñanco. "We didn't cut a fence, we didn't go at night, we didn't hide ourselves. We waited for someone to come to let us know if it bothered them, to present us with a document that the land belonged to someone, and no one ever showed up." The local Benetton office maintained that the Santa Rosa estate was company property. Benetton issued a report claiming that the estate "is not to be used for cattle raising" and stated their intentions to take control of the property. After two months of land occupation, the police dismantled and seized the belongings of the Curiñanco family. The Benetton land surrounding the Santa Rosa property continues to be unoccupied. The Curiñancos say that they will return to the land that was taken away from them, and refuse to let Benetton redraw the lines of their history. "As indigenous people, we are going to fight until the end until this land is ours," says Atilio. Eviction threats in Leleque Across the dusty highway from the Santa Rosa property, Atilio's mother, 85 year-old Doña Calendaria, has to jump the fence of the Benetton property to access water from the areas only stream.